At Crystal Treasury we have a selection of beautiful decorative and utility bohemian crystal, which is hand-cut to perfection. We offer a wide range of products reaching from Bohemia crystal glasses to Bohemian crystal chandeliers. We guarantee that all products we have to offer are 24% PbO genuine hand-cut Bohemian crystal and therefore of the highest quality. Our extensive collection includes items such as vases, bowls, boxes, baskets, trays, glasses, tumblers, decanters, carafes, jugs, perfume bottles, candlesticks and various gift items. Except of clear crystal, we carry colored, so-called “cased” cut crystal and also hand-painted, gilded crystal further decorated by raised High Enamel flower paint. All painting is done by 18 karat gold and porcelain powder. You may also enjoy our Bohemia Crystal chandelier range. It includes wall sconces, table and floor lamps and, of course, Bohemian chandeliers with various numbers of arms, so there is size and shape for everyone. We offer various trimmings for our chandeliers, including Swarovski. Famous Maria Theresa chandeliers with metal arms clad in crystal. Chandeliers with traditional dense and/or light cuts. Chandeliers decorated with High Enamel and gilding. Cased crystal chandeliers and chandeliers with brilliant trimmings. Extensive range of Czech garnet jewelry. It includes bracelets, necklaces, brooches, pendants, earrings watches and rings. Czech garnet is unique due to its nice, fiery red color and excellent light refraction. Our garnets come with the Certificate of genuine Czech jewel and bears G or G1 mark. Our garnets are produced either in 14Kt Gold plated sterling Silver, or Silver coated with Rhodium. (Rhodium protects the Silver). Blue Onion, Zwiebelmuster and Royal Dux porcelain. We also carry a very wide selection both of Royal Dux figurine and other decorative porcelain and also Blue-Onion (Zwiebelmuster) decorative and utility porcelain. Royal Dux Porcalain was being produced continuously since 1853. It is very much appreciated for it’s unmistakable beauty, extreme durability and whiteness shard. Zwiebelmuster, or so-called Blue Onion porcelain, for its specific character and design, became greatly desired as family porcelain, handed down from generation to generation. For many years, it has been made with no changes of shape or design, and since the in-glazed decoration is very durable, it is permanently possible to supply each set with missing or new traditional pieces. Due to continued attention devoted to the development of new products, the assortment is being increased by new, additional components, both utility and decorative. You may end up feeling like you are in a Bohemia Crystal Palace when you take a look at all of the delightful hand-made products that we offer for sale. You are bound to like something whether you want an item for your loved ones or something for yourself. Each category has a big selection to choose from. It is easy to find something that you will really like, in the right size and style. Buying online will save you money compared to buying in a store and we do ship all our products worldwide. We ship using well-known and trusted companies (FedEx). All packages are covered with full insurance and in an unfortunate case of damage we will immediately replace any item absolutely free of charge. Where has Bohemian crystal come from? The oldest glass products come from ancient Egypt. The very first technology of glassmaking was the winding of the glass threads on a form made from clay. 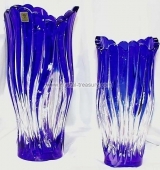 The oldest blown glass is believed to be made in ancient Fenicia and Greece. While the early Egyptian glass was imperfect due to the materials used (it was usually melted from fritted (porous) glass), ancient glass was already fairly clear. In 3rd and 2nd century B.C., the glass making knowledge was spread throughout the Mediterranean. Typical products made in ancient times were decanters, carafes, bottles and simple goblets. The oldest glass findings (bracelets, beads) in Czech countries were probably imported from Celtic regions, at approximately the 3rd century B.C. It is possible that some beads from the Great Moravia time period were of local origin. Written documents about knowledge of glass making in Czech countries come from the 12th century. The oldest glassworks are found in archaeological and written findings of the 13th century. In the Middle Ages, the production of glass grew as never before. Glassworks spread greatly at the borders of the country using the richness of the forests (as wood was needed to heat the glass furnaces and for the production of potassium). The richness of the community’s people also assisted in the growth of glassmaking in Czech countries. Even though the glass products were expensive, they were found in both the upper and middle class households. In the towns populated in the Middle Age, there were many archaeological findings of glass to support this. After the Thirty Year War, in Czech countries, clear glass called Czech or Bohemia Crystal began to be melted. The character of this glass corresponded to the Baroque art style. Bohemian Crystal became a specialty and the demand at the beginning of the 18th century was so large that the Czechs became the largest exporters of crystal in the world. At this time, many new glass export companies were founded and they had affiliations in many important ports, not only in Europe but in Asia and South America also. Since the Middle Ages, Bohemian glass has had a special position in Europe. This stood as a measure of quality and brought technical improvements. Thanks to the wide assortment and abilities of Czech tradesmen, Czech glass could soon be found all around the world. The Czech glassmakers were working in many countries, helping to establish glassworks, build glass melting furnaces, train new glass masters, etc. All these aspects have helped to make a very strong tradition, which is still carried on today. It is difficult to say where mankind will go in the new millennium and where the automation and evolution of technologies will lead us. It is plausible that most of the glass production will be automated but there will always be a space for art and handmade works coming from the skilled hands of glass masters. Exactly in the strong tradition of art and hand made production is the potential of glass making for the future.